Investing is a smart way to build your wealth. To afford to invest, you might borrow money and pay it back with interest. This is known as ‘gearing’. Whether you’re positively geared or negatively geared will impact how much you can expect to profit from your investment in the short and long term, so you’ll need to know the difference. Simply put, positive gearing is when your investment returns an immediate profit. To achieve that, the returns on your investment must be greater than your interest and other expenses. For example, an investment property can be positively geared if the rent you collect is greater than the interest on repayments and maintenance expenses. What’s left is your profit and the property is positively geared. The obvious benefit of positive gearing is the ongoing income it generates. Investors often use this income to fund additional investments and grow their portfolio. Alternatively, you might use the income to pay down the principal of any investment loans you’ve taken out. A positively geared investment can turn even more profit if it increases in value from the time you bought it and when you choose to sell it. This profit is known as a capital gain. Any profits you make from a positively geared investment have to be added to your taxable income. This can be a disadvantage if the extra income pushes you into a higher tax bracket and, therefore, results in you paying a higher rate of tax. Negative gearing is the opposite of positive gearing – that is, the income you make from the investment is less than the expenses – and often results in a short-term loss for the investor. For example, an investment property is negatively geared when the rent you collect from the property is less than the interest on repayments and maintenance expenses. The same applies if you’ve borrowed money to invest in shares and the dividends are less than the interest on the loan. This means the investor has to cover the shortfall, so they’re negatively geared. 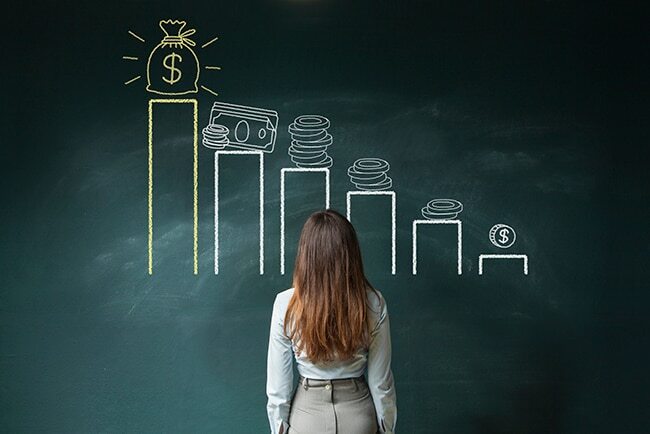 While it may sound silly to make any investment that results in a loss, investors tend to prefer negatively geared investments for two major reasons. First, the loss can be deducted from your taxable income, reducing the amount of income tax you pay and (potentially) pushing you into a lower tax bracket. Second, negatively geared investments – such as properties or shares – are favoured for their potential to yield higher capital growth in the long term. That means the profits you make when you sell the property or shares will, if managed correctly, outweigh the losses you made while owning the asset. The big drawback to a negatively geared investment is the short-term loss. Because the overall profitability of a negatively geared investment depends on long-term capital growth – which isn’t guaranteed – it is a riskier strategy than a positively geared investment. So, if your investment is expected to be negatively geared, then you’ll need to have the funds available to cover your short-term losses while you wait for the long-term capital gain to kick in. So, would you prefer short-term growth or long-term gain, and can you take the risk? Most investors try to balance their portfolios with a mix of positively and negatively geared investments to mitigate the risk and maximise both short- and long-term performance.